The Amstel Gold Race signals the start of the Ardennes Classics, and the first signs of who's looking good for the Giro. Raced over the hills, dales, and forests of south eastern Holland, the course selects its own worthy winner. Twenty years ago it was Mauro Gianetti who was making the news. 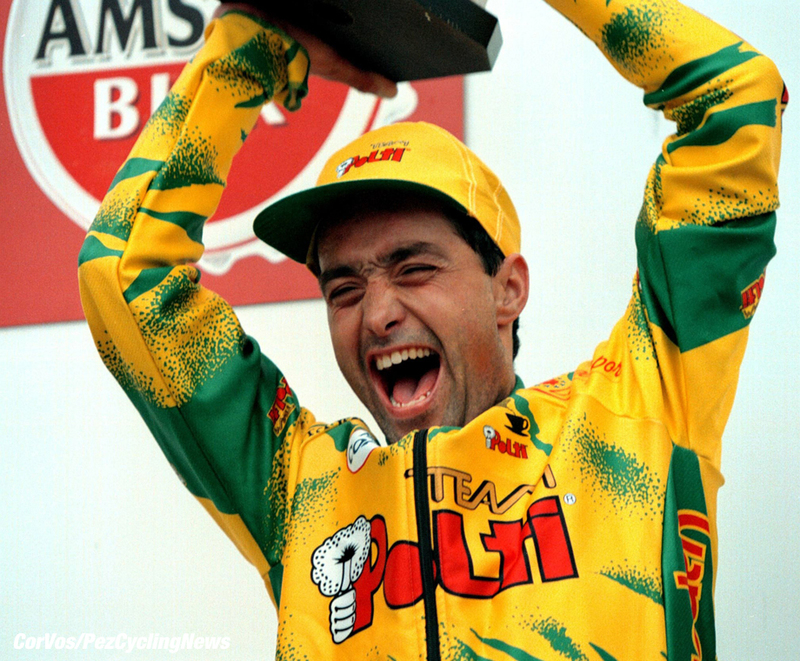 Gianetti rode for Polti back then and had just pulled-off the biggest win of his career, in the 1995 Liege-Bastogne-Liege - LBL was the week before the Amstel in those days. Some said that his win owed more to craftiness and luck than talent; Gianetti would soon dispel that notion. The final selection came down to Cassani and Gianetti. PEZ: Tell us about the Amstel, Mauro. Mauro: It's a special race, the climbs aren't so hard but there are a lot of them, the roads are small and the route constantly changes direction. It's a very difficult parcours to take-in if you haven't ridden it before, it demands 100% concentration. There's no one place, like La Redoute in Liege or Arenberg in Roubaix where you know that a decisive move will be made; it could go anywhere. PEZ: That was a real purple patch, winning Liege and Amstel in the same week. Mauro: I knew both of the races very well; I had several top ten finishes in both of them prior to winning. It was a special period in my life; I had great form and the experience it takes to win races over these distances. Over 200 kilometers and especially 250, it tends to be the older riders who are to the fore. 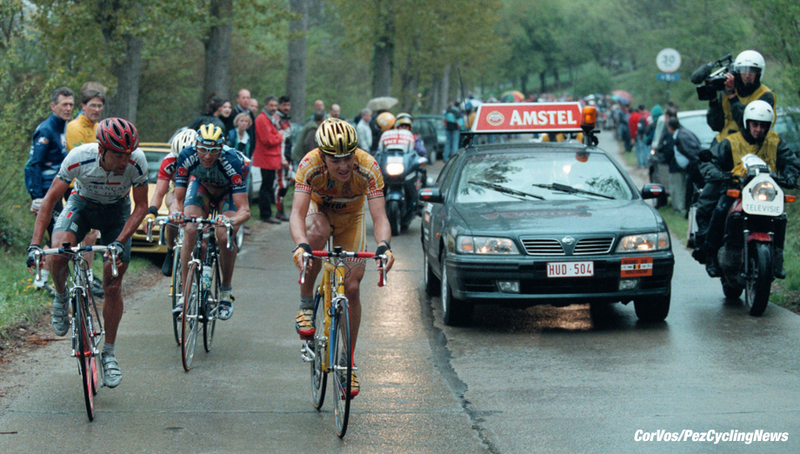 I wasn't an explosive rider but the Amstel was a race that suited my experience, endurance and power. PEZ: You must have been closely marked at the Amstel? Mauro: I had good condition and in a race like the Amstel it's important to be at the front, so being marked doesn't matter so much; I changed my tactics from Liege and instead of being conservative I was involved in attacks from the start, imposing myself upon the race. In the Amstel, the situation can change in a moment, you can't say; "I will attack here" because you never know how the race will go, like I said, you must concentrate 100% of the time. Gianetti enjoyed his Spinergys on the road to the finish. PEZ: I noticed you were on Spinergys at the finish, cutting-edge back then. Mauro: That was because I crashed and changed bikes I finished on the spare machine, I didn't start on Spinergys but having said that, I liked them, they were good wheels. PEZ: Tell us about the crash, you lost a lot of skin, didn't you? (After the race Gianetti said he felt like abandoning, but five of the Polti squad dropped back for him and he didn't want to let them down). PEZ: You were in a break of seven towards the end weren't you? Mauro: Yes, but I had been active all day, I had good morale and I could see that Bugno (race favorite and twice world champion, Gianni of Italy & GB) wasn't paying attention. I jumped clear from that break with around 20 kilometers to go and only Bugno's team mate, Davide Cassani (Italy) could come with me. 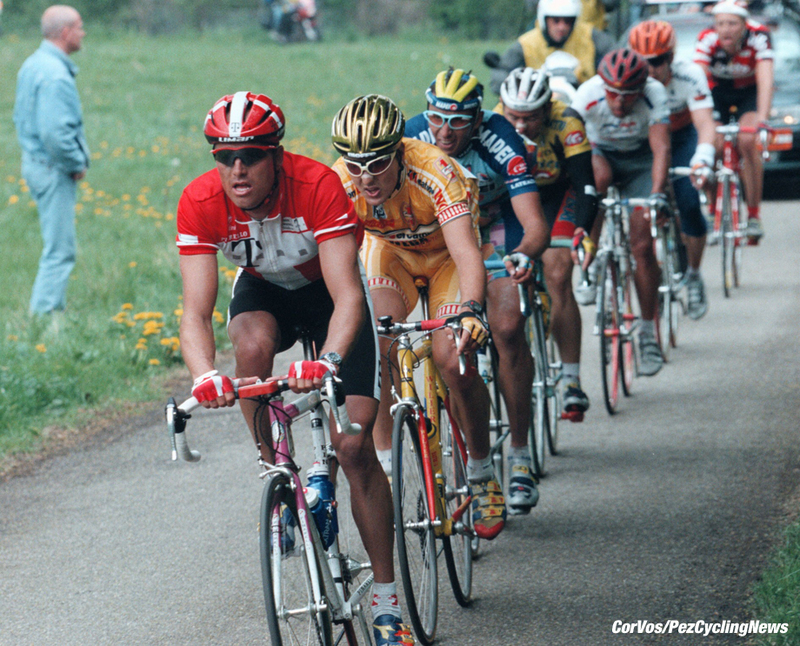 PEZ: Cassani wasn't keen to work, was he? Mauro: No, I spoke to him and he said that he was there to defend for Bugno, meanwhile, back in the group Bugno was saying that he couldn't work because he had Cassani in the break! 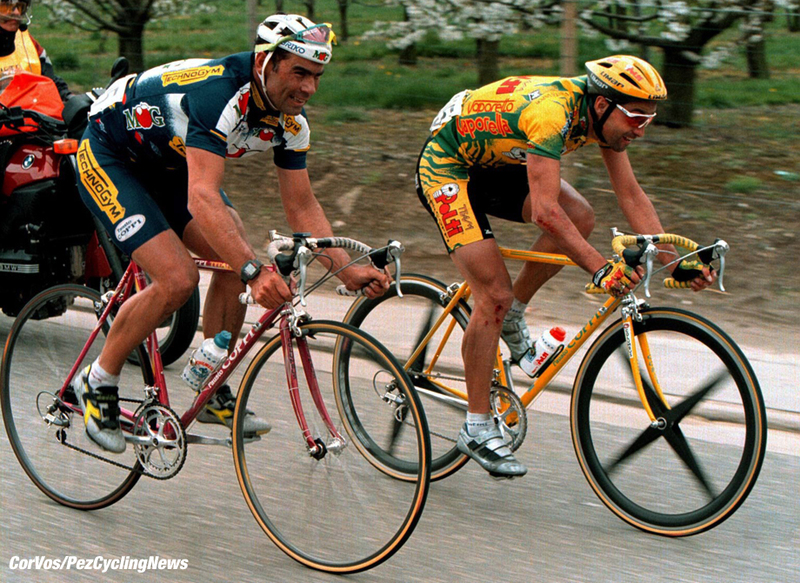 PEZ: Weren't you worried about 'carrying' Cassani? Mauro: The way I looked at it, the worst that would happen was that I would be second; if the group came up I would be seventeenth! 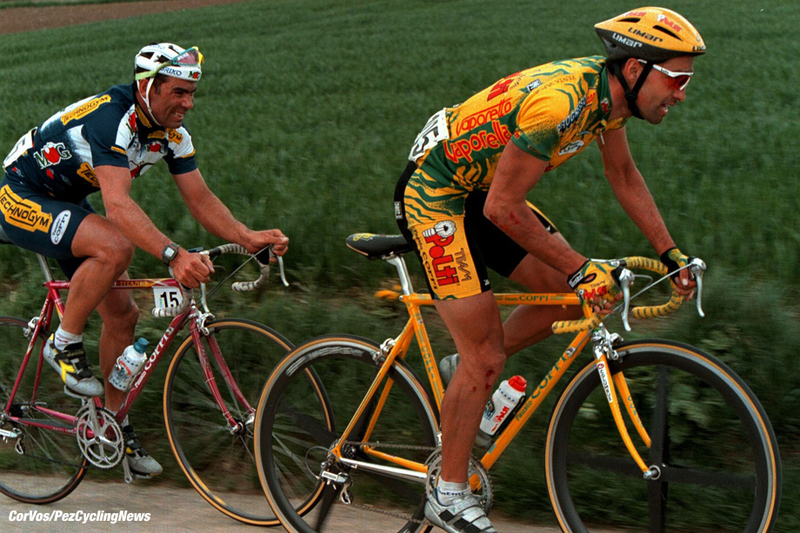 He was saying to me; "I'm not good, I wait for Bugno", I knew he was foxing, but there was nothing I could do and I thought; "well, there's a chance I can beat him." PEZ: Cassani led the sprint out, didn't he? 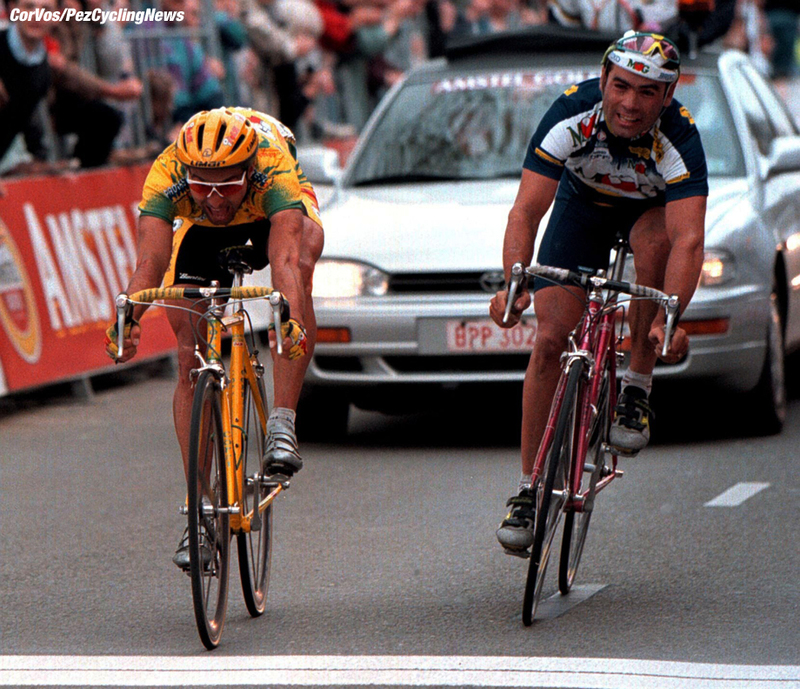 Mauro: He made the same mistake as Hoste did at Flanders in '07, I was saying; "Hoste, you go too early!" In the last kilometer I was thinking that second wouldn't be so bad; Cassani went from about 250 meters and got a gap, but by 150 to go I had clawed him back a little and I said to myself; "Mauro, it's possible!" I gave it 100% and it was only in the last ten meters I passed him. If he had left the sprint until later I don't know if I would have beaten him. Gianetti was over the moon - and why not??! PEZ: Do you and Cassani still laugh about that day? Mauro: He's an Italian TV commentator now and he tells his audience about the time he should have won a World Cup but made a mess of it.